Colorful and bright, this special bouquet is a wonderful gift for sending joyful wishes. 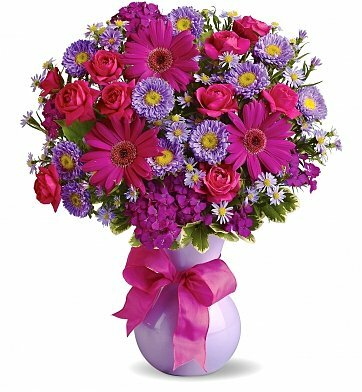 The bouquet features a playful mix of pink and purple flowers such as spray roses, gerberas, matsumoto and monte cassino asters, and sweet william. When accented with greens in a stylish vase, the arrangement is ready to light up the home or office with a feeling of happiness. Hot Pink Miniature Gerbera Daisies. Arrives in a stylish ceramic vase. Joyful Jubilee Bouquet is a hand delivered gift. These gifts are delivered by one of our local design centers located throughout the United States and Canada. Same day delivery is available for most gifts when ordered before the cutoff time. The cutoff time for Joyful Jubilee Bouquet is 2 PM in the recipient's time zone. The 'Joyful Jubilee Bouquet" brought much joy to my daughter on her birthday! These flowers were exceptionally beautiful! They were purchased for one of my staff for Nurses Appreciation Week. When she saw the flowers, the beauty caused tears to drip from her eyes! This is an excellent arrangement and is highly recommended! Many staff began asking where I purchased them from! Make someone have that special moment and purchase flowers for them!